International diabetes organizations are calling for weight-loss surgery to become a more routine treatment option for diabetes, even for some patients who are only mildly obese. But Tuesday’s guidelines mark the first time the surgery is recommended specifically as a diabetes treatment rather than as obesity treatment with a side benefit. They expand the number of eligible candidates. About 26 million Americans have diabetes, mostly the Type 2 form where the body gradually loses the ability to produce or use insulin to turn food into energy. Many Type 2 diabetics, although not all, are overweight or obese. Many can control the disease with diet, exercise, medication or insulin – but years of poorly controlled diabetes can lead to heart attacks, strokes, kidney failure, amputations or blindness. DOES OBESITY SURGERY REALLY HELP WITH DIABETES? Until now, health guidelines have focused on obesity surgery as a last-resort method for quick weight loss, with diabetes improvement considered a bonus. Tuesday’s guidelines examined 11 studies that tracked diabetes patients randomly assigned to bariatric surgery or regular care. They conclude the surgery should be a regularly considered option for certain diabetes patients – with the emphasis on better blood sugar control instead of pounds lost. It’s recommended for patients whose BMI, or body mass index, is at least 40, regardless of their overall blood sugar, and for patients with a BMI of at least 35 whose diabetes is inadequately controlled despite lifestyle changes and medication. Also, the guidelines say surgery can be considered with a BMI as low as 30 for patients with poor control despite usual care. While weight loss itself can help Type 2 diabetes, operations such as gastric bypass and other types of bariatric surgery are thought to help in a different way, by affecting hormones, gut bacteria and other substances that affect how the body handles insulin and blood sugar. 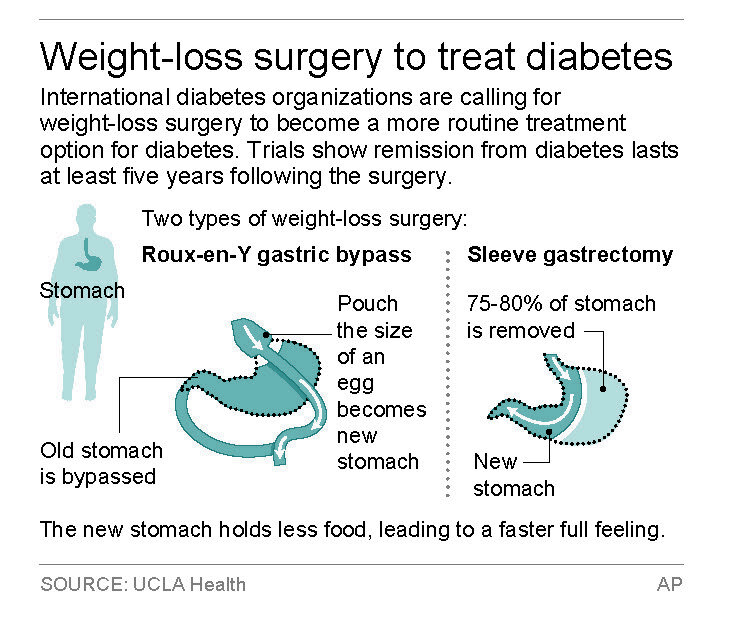 Bariatric surgery – called metabolic surgery when performed for diabetes – has become far less invasive in recent years. The risk of death or serious side effects from surgery is small and comparable to gallbladder operations or hysterectomies, said Dr. Francesco Rubino, chair of metabolic and bariatric surgery at King’s College London, who helped write the guidelines. Such operations cost $20,000 to $25,000. Medicare pays for certain types of bariatric surgery for the very obese who have at least one obesity-caused illness, including diabetes. Some insurance companies do as well, with varying rules. It’s not clear if coverage would be expanded for those affected by the new guidelines.